In 1945, nearing the end of WWII, Hiroshima, in Japan, was subjected to a nuclear bomb attack which killed at least 80,000 people. It was (and presumably still is) one of the worst events of modern warfare in history to date. Millions were burnt alive, and others were scarred by the radioactive fallout. Some films, such as both the Japanese and States version of the popular idea of ‘Godzilla’ (1954/1998) are some such examples of looking at this active fallout in a sort of responsible and adult way, looking at what would happen if a piece of radioactive material infected an animal and it mutated. Why do I hear you ask, am I going on about ‘Godzilla’? Well, basically this film can be considered to be a hybrid baby of the original ‘horror monster’ idea, using both the general feel and idea used in ‘Godzilla’ with the camerawork of ‘The Blair Witch Project’ (1999). Critics have labelled it science fiction, and to be honest, I personally believe it‘s more of a possible ‘The Day After Tomorrow‘ (2004) futuristic present day event than anything else. It’s not just trying to be another sci-fi movie, but more of a record of a historical event done through a group of strangers. The most interesting thing about ‘Cloverfield’ before looking at the movie itself is that it has been acclaimed for having such a positive effect on the Internet by engaging the public. Months and months of sceptical and anticipating viewers were trying to find out what the monster looked like even before the film was released. The posters and trailers gave nothing to help potential viewers work out even what the plotline was. Chatrooms and forums were buzzed with various questions and theories as well about the movie. And even now, after the film’s release, people are still trying to work out what the monster is, where it could of originated from, and if it could be a possibility through natural science. So come on Matt, I hear you cry, what’s so good about this movie? Well, it’s feel, it’s drive, and it’s tactful suggestive ploys are what makes you believe the idea is possible. The film gives you no narrative to start with bar the fact that the camera was retrieved in Capital Park by the US Government, and even no indication of who the characters are and how they are related, as it starts off with an ordinary guy waving a camera about in an apartment room with a woman in front of him (bearing in mind every character’s ’hidden’ details are subsequently revealed and disclosed as the film develops). It’s realism is possibly the sole purpose of how it keeps you watching what’s going on for 90mins. It captivates you, the viewer, into the scenario that as soon as there’s an emergency (which of course is showing the monster to be an allegory of 9/11) everyone panics in a way that is uncontrollable and frantic, and that from this, people within the boundaries of just being ordinary people at the wrong place and wrong time have their own important and harrowing stories to tell in a ‘I was there‘ way. The digital hand-held camera itself is possibly the most important part of the movie to consider. It can be seen to be our own eyes and ears and our way of being a possible character as the storyline develops, as it tries to show you as much as it possibly can, although at times this can be limited due to it being just a frame/piece of glass which can‘t show anything to the sides or behind, due to the occupants own movements. The footage of the action that progresses never stops (not unless it has to because of someone dying, or because of a exterior character talking into it and ending their convo, etc) and this deserves at least some credit. It’s constant ’accidental’ flickering backwards from the destruction of New York with CGI effects (such as explosions and monsters) interspersed with the two main character’s date in Coney Island a month before it occurs (on the tape), are what keeps the film continuing to be fresh, intriguing and gripping in your mind, and gives cinema new direction on which to base storytelling on. It not only allows you to believe that you’re actually there by what you see and here, but it indirectly gives you the sense you are watching a person’s last few hours on Earth without having to leave your chair (done through the form of a video playback). It’s flaws are quite limited, as there are practically none, bar the shaky motion-sickness running around that happens at times, and the camera’s limitations, which are expected. However, the storyline and acting are all top notch, the location of it being set in New York, a confined space with which nobody can escape from is fantastic, the monsters are possibly the most realistic and scary things you’ll ever see in a horror film, the fact there is no music bar the ambient thuds and groans make it a treat, and even the ending, although kind of easy to guess from the start, deserves a praise for having a degree of innovative design as it ends on a strange note. It’s not another ‘Independence Day’ (1996) as people are led to believe, but something so much more. I thoroughly recommend anyone to give it at least a 20 minute shot, even if they are prejudice about this genre of film. 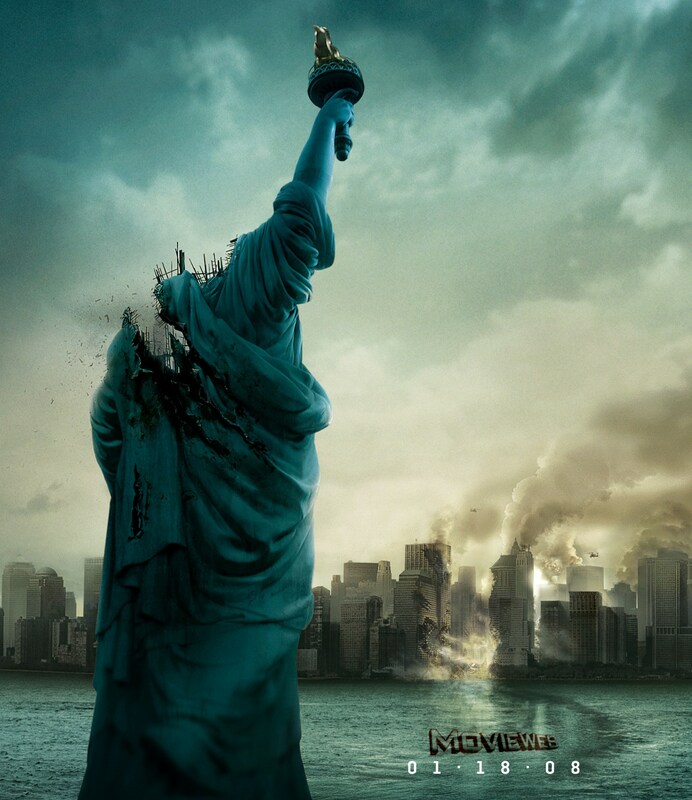 In my opinion, (although this is has now gained acclaim for being one of my favourite films now) ’Cloverfield’ is a fantastic film to watch due to it’s top notch performances and ideas being thrown around, such as its attitudes to love, loss, pain, death, friendship, and companionship. All of these seemingly draw you in to make you feel connected to what’s going on (not just for the character’s welfare) and this for me, left an imprint mentally afterwards, hence why I fully endorse and recommend it to anyone with £15 spare.